OnPage users with access to the web-based console have an intuitive, flexible and easy-to-use on call scheduler that is able to handle the most complex employee, team and group calendar configurations. Share on-call responsibility: Plan ahead. Choose who gets notified and send alerts to the right groups of people. Eradicate on-call burnout: Create schedules ensuring everyone gets on-call time off. You get alerts when you want – not by default. Increase productivity – decrease response time: On call team remembers are more likely to beat previous response times after an disturbed on call time off. Rested co-workers are more productive and happier producers. Ease of use: The scheduler was designed to be intuitive with an Outlook-like calendar look . Compatible with different time zones: Time zones are not an issue and our system will automatically adjust to time zone changes. Expand on-call rotations to teams across the country or around the globe in 175 countries and 24 time zones. Create on-call shifts based upon local time-zone business hours. Enjoy quick, easy, and intuitive setup. If you use Outlook, Mac Mail, or any similar product, learning to use the Scheduler will be a breeze. Sick Days, Snow Storms, or Vacations. No Problem! Make changes to the scheduler when assignments, objectives, or the weather changes. Never be on-call when you are in the middle of something important — unless you want to be. The OnPage Scheduler starts out “FULL”. In the event of a critical alert, if you left a time slot empty, the entire group will be notified. The OnPage Scheduler guarantees it! Competitor Schedulers start out “Empty”. Unless each time slot has been manually filled in with a group member’s name, there will be a communications gap. Your critical alert may end up with nowhere to go and no one to answer “the call”. The message: “Your server just went down”– may be left hanging, along with your entire e-commerce business. If you use escalation groups you can now add an element of scheduling to it. 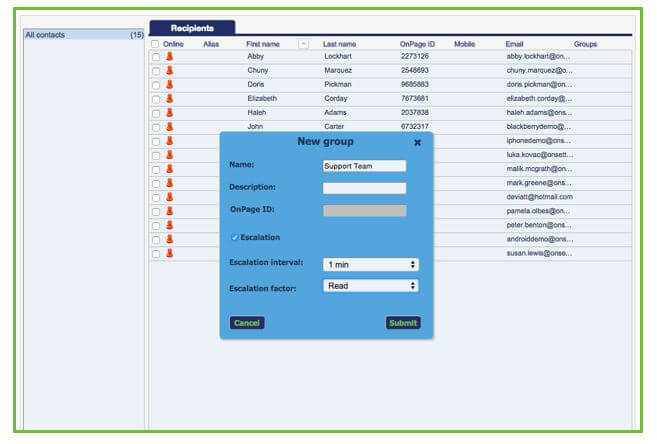 Escalation groups have proven to be one of OnPage’s most useful enterprise features by providing customers with the ability to prioritize recipients and supply redundancy to their urgent messages. Escalation orders and members can be scheduled, adding even more flexibility and customization of escalation groups. 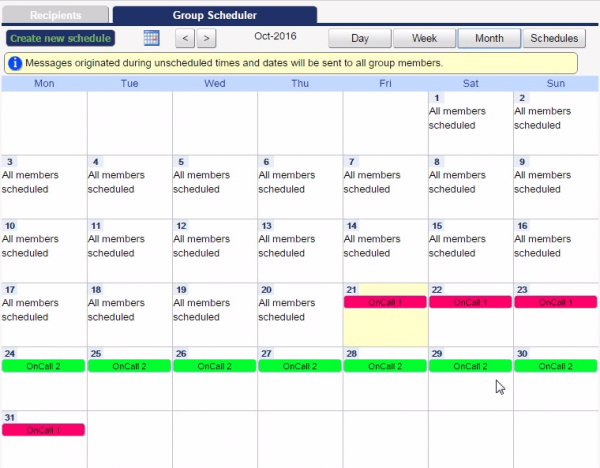 Here’s a quick example of how to get started with escalation group scheduling. 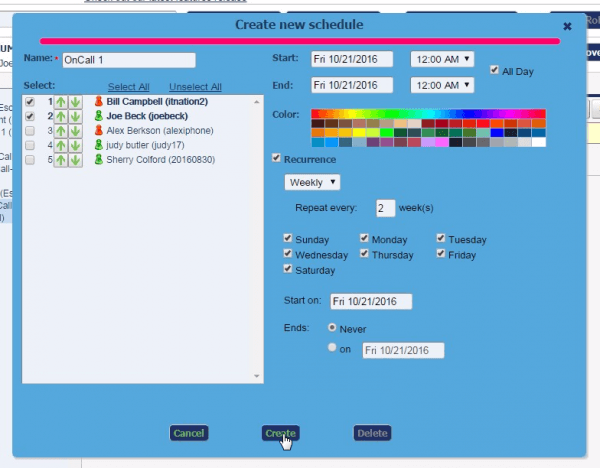 The example shows how to create a revolving schedule between 3 on-call recipients. Each recipient is in the first escalation position for one week every three weeks, with the other on-call recipients set as backups to the primary recipient. FIG1: Create a new group. You have the option to name the group, add OnPage IDs, select the escalation interval and the escalation factor. FIG2: Three people were put into the “Support Team” group. The arrows next to the names allows you to determine the order of the escalation. 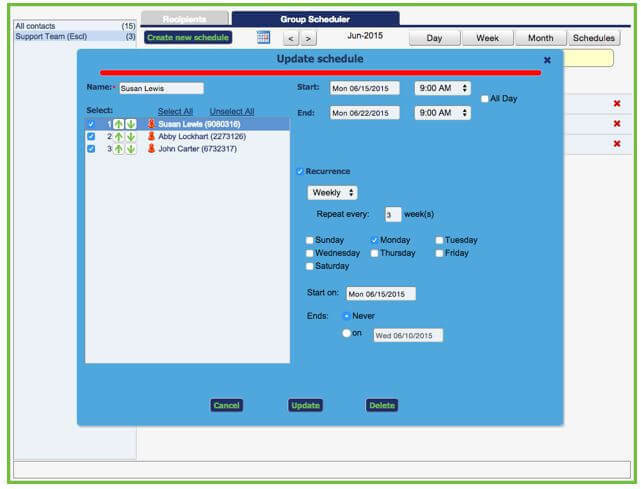 FIG3: The group scheduler tab allows you to set parameters for individuals within the group.